In Afghanistan, springtime means one thing: the start of another brutal fighting season. And if 2017 is anything like 2016 was, this fighting season could be the one that breaks the fledgling Afghan National Army for good. In what was the largest death toll yet for that army, more than 160 soldiers were killed Friday during a Taliban attack on the largest military base in northern Afghanistan. Posing as Afghan soldiers returning to base with wounded, Taliban fighters managed to slip past seven different checkpoints before launching an attack on soldiers who had just emerged from Friday prayers and were preparing for lunch. Worse, occurred in northern Balkh province, far from the traditional Taliban strongholds in the southern part of the country. The attack prompted a surprise visit to Afghanistan by U.S. Defense Secretary James Mattis, and the resignation of the two top military officials of the Afghan government. The Afghan Minister of Defense and Army Chief of Staff both stepped down following last week’s attack which American officials believe was carried out by the Haqqani network, a branch of the Taliban that finds their home in neighboring Pakistan. Afghanistan has become the forgotten war, pushed out of the headlines by the invasion of Iraq in 2003 and more recently by the emergence of the threat from the Islamic State and the civil war in Syria. But approaching 16 years of combat operations, $1 trillion in cost and the lives of approximately 179,000 people—including nearly 2,400 American military personnel—the question needs to be asked, when is enough really enough? The United States is no longer fighting to win the war in Afghanistan. It is now fighting not to lose, and that makes it a war not worth fighting. Nothing illustrates this “fight to not lose” approach more than the deployment of a small number of Marines to Helmand province in southern Afghanistan currently underway. Helmand Province is very familiar to the Marine Corps. In 2010, 21,000 Marines were based there. Battles for the districts of Sangin, Marjah, Musa Qalah and Now Zad were some of the most violent and deadly for Marines in Afghanistan, and the fight for Helmand was the largest operation of the war. Now those four districts, along many others, are back again under Taliban control. And once again, U.S. military forces will be taking another turn at “liberating” these districts from Taliban control. The Taliban claimed a military victory (which it was) while the people running Operation Resolute Support were in full spin cycle as they tweeted that the Afghan forces “left on their terms… leaving only rubble and dirt” for the Taliban. Yes, rubble and dirt that is part of Afghanistan, and for which more than 50 Marines gave their lives for, including 25 from one battalion during a seven-month deployment in 2010. Soon, 300 Marines will replace Task Force Forge, which is an Army unit that has been in Afghanistan providing support to Afghan forces. The Marines will be called Task Force Southwest and according to CENTCOM will train, advise and assist the Afghan National Army 215th Corps and the 505th Zone National Police. The former group was left without American advisors when the Marines packed up and left Helmand in 2014, and they were simply not ready to assume the burden alone. Today, it is estimated that more than 85 percent of Helmand— including poppy-producing fields used in heroin production—is under Taliban control. Perhaps the loss of most of Helmand was due to the corruption of the Afghan 215th Corps where 40 percent of its troops existed only on paper; these “ghost soldiers” being counted only to allow corrupt officers to collect extra pay. In 2015, the U.S. spent over $100 million training the 215th Corps to take on the Taliban, when in reality it appears much of the food and fuel was stolen by senior officers who choose profit over their soldiers’ lives. This Marine deployment was announced in January, and according to the Washington Post the Marines going on this nine-month mission are senior Marines, many of whom have fought in Helmand Province before. The Marines have said the need to hand-select only experienced troops from across the regiment is simply due to the need to match the growing qualifications of the Afghans they will be supporting. Maybe. Or is it that the situation has become so untenable in southern Afghanistan that the most seasoned American Marines are needed to push and lead the Afghans back into the fight? Early this year, the Special Inspector General for Afghanistan Reconstruction issued a report that painted a grim picture of the current state of the Afghan army and the territory now under Taliban control. Issued in January, the report says that of 407 districts that were spread across 34 provinces, only 258 were controlled by the Afghan government. Thirty-three districts were controlled by the Taliban and the remaining 120 were categorized as contested. And 37 percent of the country was no longer controlled by the government in Kabul. The Afghan army has about 180,000 soldiers but suffered over 15,000 casualties in 2016 (including over 6,700 killed) and are affected by extremely high attrition rates, which were reported as high as 33 percent. That means every year, through desertion, casualties, and low enlistments, one-third of the Army must be replaced with new, raw recruits. Corruption is so rampant, that the Afghan general assigned to investigate the true scope of corruption within the army was himself recently arrested on corruption charges. Despite billions of dollars in assistance and over a decade of training, Afghan army and police units cannot stand on their own across the span of the country. Seven months before leaving office, the Obama administration admitted as much as they eased restrictions on the use of American air power. We’re going to have to confront Russia where what they’re doing is contrary to international law or denying sovereignty of other countries. For example, any weapons being funneled ere from a foreign country would be a violation of international law unless they’re coming through the government of Afghanistan for the Afghan forces, and so that would have to be dealt with as a violation of international law. Nichols, echoing his earlier comments in Washington, said that Russia was arming belligerents in the country. It appears that once again, many hands are reaching into Afghanistan for their own gain, rather than assist the Afghans to run their own country. This is by no means anything new. Afghanistan is the 41st largest country in the world. Bigger than France and Spain and a little smaller than Texas. Yet none of Afghanistan’s present day borders were “officially” created until the end of the 19th century and the borders were drawn by the external powers of Russian and Great Britain. “The Great Game,” as it was called, was a power struggle between those two nations for control of Central Asia. Afghanistan was created as a buffer between India, controlled by Great Britain, and Russia’s newly acquired territory in Central Asia. These artificial boundaries have helped create the problems of forming “one” Afghanistan, as the collection of ethnic groups and tribal relationships prefer to stay local rather than national. These deep tribal grievances and distrust is currently rampant within the Afghan military and government. Outside influences have always been a problem for Afghanistan, and now that trend is continuing with Russia reaching back to support the Taliban, Iran providing assistance, and of course Pakistan providing the currency of instability for Kabul. And this is a problem for not only the government in Kabul, but for the Taliban who are trying to complete its original objective—the establishment of a fundamentalist Islamic government. The Taliban, with numbers estimated at 25,000, have alienated much of the Afghan population with their unforgiving version of control including the Pashtuns, the largest ethnic group in Afghanistan. These people were the primary supply of Taliban fighters, but the Pashtun population on both sides of the Afghan/Pakistan border have been the most aggrieved by them instead. Still, the single largest benefactor of the Taliban would be Pakistan. That country has been allowed to operate in direct contradiction to American efforts in Afghanistan, providing safe havens (remember Osama bin-Laden was killed there) and a near-endless supply of soldiers to continue the fight for the Taliban. Pakistan was threatened into cooperating with America immediately after 9/11, and it is past time for this threat to be made again. With the consequences of continuing such actions clearly laid out to Islamabad, the American involvement in Afghanistan can be one huge step closer to ending. There’s little doubt Pakistan is a state sponsor of terrorism. Pakistan might only change if this label was applied, and if the U.S and Europe applied strict sanctions that hurt Pakistan hard enough to make a decision about future support of Taliban or terrorism efforts directed against India. As Foreign Policy noted last year, it’s time to stop writing that country blank checks. Making things a little more complicated for an American withdrawal is the arrival of militants from ISIS, who have set up operations in eastern Afghanistan. Calling themselves the Islamic State of Iraq and the Levant – Khorasan Province (ISIS-K) they announced in January 2015 their establishment in Afghanistan. Numbering less than 500, ISIS-K has not made any friends in Afghanistan and suddenly found themselves in direct conflict with the U.S., the Afghan military and even the Taliban who did not approve of the attempt by ISIS to interlope on what they viewed as their fight. The U.S. has continued airstrikes on ISIS-K positions, including dropping a MOAB on a cave complex recently. Al Qaeda in Afghanistan is only as strong as the Taliban are, and while Al Qaeda was thought to be a diminished threat, that may only be true in Afghanistan as other branches of the terrorist organization have made greater impacts in other areas of the world, mainly Syria, Yemen, the Maghreb and Somalia. This again goes back to the pressure needed to be applied to Pakistan as they hold the keys to a less combative Afghanistan. America has met its original goal of making Al Qaeda ineffective in Afghanistan, but has failed miserably in the aspect of nation building. Afghanistan will not be formed into one cohesive nation, regardless of how much money is spent or how many bombs are dropped. Historically, Afghanistan has had a weak central government and local warlords and tribal leaders have been the true government, and it is this history that has helped the Taliban achieve its aims. Plus, America has spent more on reconstructing Afghanistan than it did in Europe after World War II, yet complete military control and extensive development of the country has been elusive. The Afghan military is still not able to provide security for the whole country, billions of dollars of investments have been wasted on projects that cannot be financially sustained, and despite nearly $9 billion in funding to fight opium, Afghan still leads the world in opium production and is growing more than ever. Afghanistan, in many aspects, has been a colossal failure for America, and that unwillingness to admit failure is dangerous. How far and long does the country go before this is acknowledged? Afghanistan is not like Vietnam and the failure of that war effort—there are no mass demonstrations against the war like Vietnam, there’s no military draft to protest, and no nightly news about nothing but Afghanistan. It has become the war no one talks about. The forgotten war, except for those moments when a MOAB is dropped and suddenly people remember Afghanistan is still a warzone. Withdrawal from Afghanistan will not damage the national American psyche like Vietnam did. Most of the American population may not even notice. However, removing American and NATO forces from Afghanistan will mean the beginning of the end of the Afghan government that is in power now. Recognizing its inherent deficiencies combined with the loss of American and ISAF forces to perform the heavy lifting, the Afghan military refocused its strategy and centered on protecting the major Afghan population centers rather than controlling the entire country. The Taliban will exert control over large areas and as the fighting season moves into full swing, the Taliban are able to smell the blood in the water. With only 8,400 U.S. troops there now, much more than 37 percent of Afghanistan could very well be under Taliban control by the time fall and winter come. Like a Greek tragedy, everyone can see the end coming but they keep watching just to make sure it ends the way they knew it would. Nothing short of another 100,000 American troops returning to fight will stop what is inevitable. The spring offensive of 2017 deserves more attention than it will likely get, but the time has come for the United States to withdraw from Afghanistan and let the Afghan government find its own way. 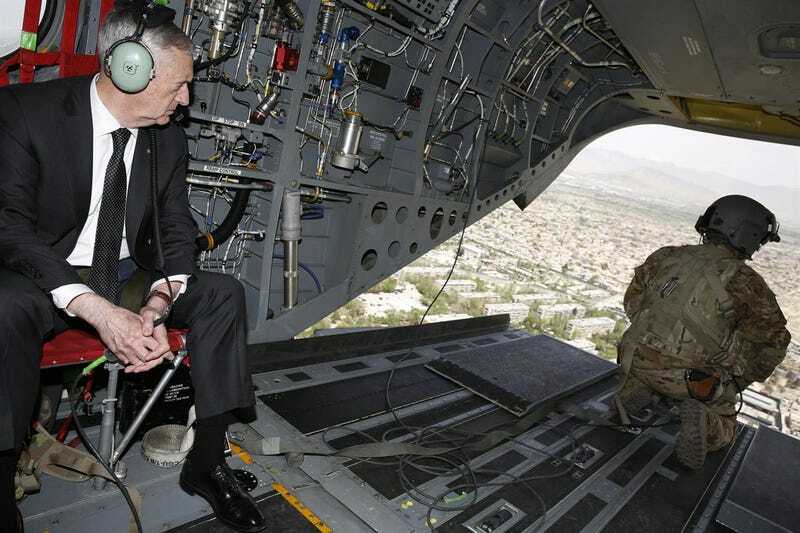 In withdrawal, America does not have to abandon Kabul completely. The most beneficial use of American power right now for Afghanistan will be to compel Pakistan to act responsibly with heavy sanctions over its support for the Taliban, and what the consequences of that assistance could mean. Short of that, the death of one more Marine fighting over “rubble and dirt” in Afghanistan should not be allowed to happen.